The Justice System changes the whole gameplay of Elder Scrolls Online. Previous versions of the game allowed players to steal every item in the game without any risk of being caught. You could approach trader’s post, or enter any house and take everything you saw there. It looked unusual and unnatural when NPCs saw you stealing their goods and didn’t react. Now everything changes! Update 6 adds the Justice System, that will make gameplay more interesting and challenging. Now most of the goods and property of citizens in Elder Scrolls Online is protected by law. If you take someone’s property you may be caught. If you wish to steal, make sure nobody can see you. If an NPC or guard witnesses your crime you will have to pay for your crimes. It must be noted that not all items in the world belong to NPCs. So how do you understand that an item is protected? Just target an item and if you see red text – it belongs to someone. By picking up any item with red text you put yourself at risk of being caught as a criminal. The New Justice System doesn't limit you to just stealing from crates and houses only. Now every NPC has an inventory! Do you remember thievery in Oblivion or Skyrim? 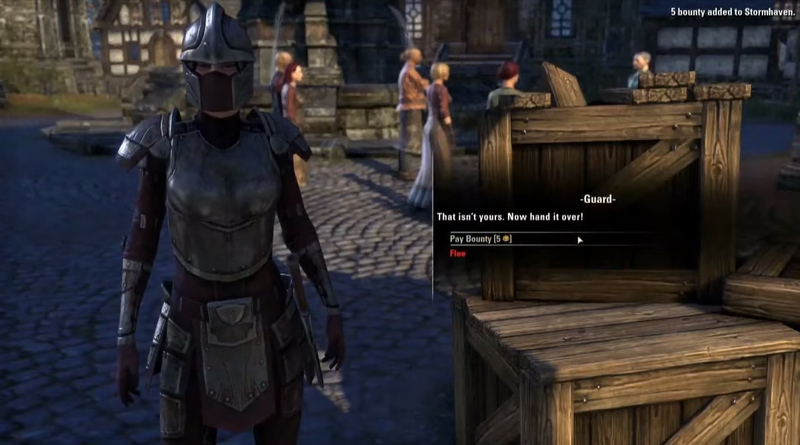 Now the same system exists in Elder Scrolls Online , allowing you to pickpocket items from NPCs. First of all, you need to start crouching and approach an NPC from behind. When you become close enough, a special prompt will appear signalling that there is an opportunity to pickpocket your target. Note that there is a chance ofthe crime may be unsuccessful and you can be caught. It’s a risky way of getting items. You can’t sell stolen items to legal traders. There are special traders in thieves’ hideouts where you can sell all the goods you have stolen from citizens. You can also find special NPCs who can help you to decrease bounty clearing your reputation. Of course you will have to pay for that. Such refuges can be found in all big cities of Tamriel. Justice System adds two opposite sides: Outlaws and Enforcers. Player can join any side. If you want to steal and murder – become Outlaw. If you want to protect citizens and catch criminals – join Enforcers. You can switch between these roles anytime. Becoming Enforcer is easy: you need to find one of Enforcer Towers (these towers are usually located near big cities) and talk with NPC there. After you declare yourself as Enforcer you will get a special tabard. Put it on and you will be able to see acts of crimes and bounty level of all players. Enforcers are patrolling cities looking out for Outlaws and trying to stop them. If Enforcer finds an Outlaw he can stop him from reaching outlaw refuge and selling his stolen stuff. Refuge is a safe zone where criminals can’t be attacked and stopped. How to stop criminal? Enforcer can attack criminal engaging him in PvP fight. Yes, developers finally added PvP outside of Cyrodiil! If Enforcer wins he can loot corpse of his enemy player and take all stolen goods. These goods must be returned to one of Enforcer Towers. When Enforcer returns stolen goods he receives reward for that. But an outlaw can resurrect and try to return his stuff back before Enforcer reaches his tower. That’s how this system works in general. Outlaws are hunting easy victims and Enforcers are hunting Outlaws. Being Enforcer is not a boring duty: you can attack Outlaws and you also have access to special bandit caves. When you travel around the world you come across special clues that give you hints to location of bandit caves with chests and other objects. These chests are filled with stolen items. You can take these items and return to Tower getting reward in return. Which role is more interesting: being a sheriff or a criminal? It’s you to decide. 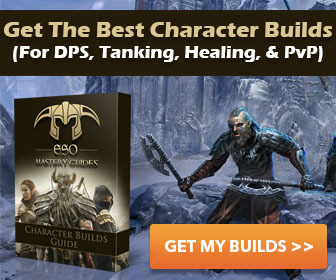 Elder Scrolls Online doesn’t lock you within one role. You can change the role any time and try both sides. We recommend to try both sides because you will understand behavior of Outlaws and Enforcers. This will help you to act much better when you choose your side. I think this is actually a very nice part of the game. I think I will try both outlaw and enforce. It's quite a nice way to go PvP outside of Cyrodill.